So here we are Challenge #33...only one more to go after this one. We do have some exciting things in the works...and I know we are all looking forward to sharing more fun and creative adventures with all of you! As always, lets take a moment and thank our very generous sponsors. Inspiration Emporium has donated a very generous $50 gift certificate to be awarded to a lucky someone along with the stash of goodies Tim and Mario donated! Those guys are so very generous. Make sure when you play along that you follow the rules, they are really easy peasy. I have been absolutely in love with blues lately. Can't seem to get enough of them, wink. along with some Picket Fence Distress Paint. To create the background I put some of all the colors of Distress Ink onto a non stick craft sheet. Spritzed it with water, stamped a clear block into the puddles to pick up color. Then over and over again stamped that on to a tag. Once the color was the way I wanted it I smeared some Picket Fence Paint onto my craft sheet, spritzed it with water and did the same technique with the acrylic block. Dry with a heating tool, once it's dry I blended on Salty Ocean with a blending tool to just even it out a bit. Really fun technique...hope you might give it a try! It creates so much texture in the background. and used the technique you will find on page 45...this is one of my faves. Love the vintage worn feel you get. So that about covers it I think. If you haven't already make sure and check out what the rest of the Curiosity Crew created. It is so fun to see what everyone is up too...I LOVE being able to hop from blog to blog and soak up all that lovely inspiration! Also I just wanted to say THANK YOU so much for all your sweet and kind comments. You, ALL of you have made this journey so fun, special and inspirational! Sometimes I am just sitting with my mouth hanging open at what you all come up with! Gorgeous, Yvonne. Love the blue and your altered surfaces technique. You do blue so well! LOVE the butterfly...just stunning to say the least! This tag is fabulous Yvonne!!!! Oooohhhh, all my favorite colors in one piece! This is so beautiful and feminine; I am gaga over that gorgeous ribbon and all the pretty details. Love your BLUE tag.. Amazing all that blue looks so pretty. And the butterfly is extremely fascinating.øthank you for sharing your awesome wirk. Your blues are soooooooo pretty and the message is awesome! You have certainly spread your wings ... the technique is beautiful ! Wowzers, Yvonne! This monochromatic tag is beyond beautiful! Love your shade choices, and I have never tried that background technique but surely will now! So very pretty! I can see why you are loving the blues in this piece. Just stunning. Gorgeous tag, love the colour and your technique. If anyone wants to know Yvonne Blair, they should just look at your art. I don't know anyone whose heart and soul is more transparently expressed in their art. This is no exception. The tag is gorgeous, the technique is perfectly done, and the messaging is, as ever, inspiring. Thanks for being fabulous!! As you well know, I did try your background technique and love the end result! And I'm a fan of blue as well...so naturally, I think this is my favorite piece by you yet! This is so elegant Yvonne! One of my fave colors too! 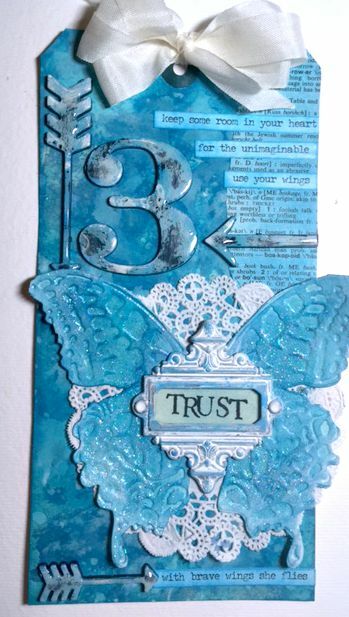 Yvonne, I love all the blue tones on this gorgeous tag! Your altered surfaces are so beautiful too! Fabulous! there is nothing 'blue' about this tag my sweets!!! i absolutely love everything about it!!! your butterfly is stunning! Great tag! I love how the white ribbon sets the blues so nicely! And the butterfly body...great idea! That sounds like a really interesting way to make a background, must have a go. This is a lovely piece the metal altered surfaces are fabulous. Oh and of course a wonderful butterfly! I really like the doily behind the butterfly. Love the Tag! Your altered surfaces are amazing Yvonne. Your entire tag is wonderful. Love the layout and the colors - so many slight variances of blue... LOVELY. j. Such a lovely blue piece it is! Your colors are wonderful, and love the design and textures. Such a beautiful blend of blues. Love the pop of white under the butterfly. Your altered pieces look like metal Nice work. Yvonne, I'm loving the colors you used on this tag! Great background and thank you for sharing your technique with us for that. I'm definitely going to give it a try! Your altered surfaces are perfect, and the entire tag just speaks to me from the color to the composition! Always a delight to see your work! Hugs! this is so pretty!!! I love the blue. 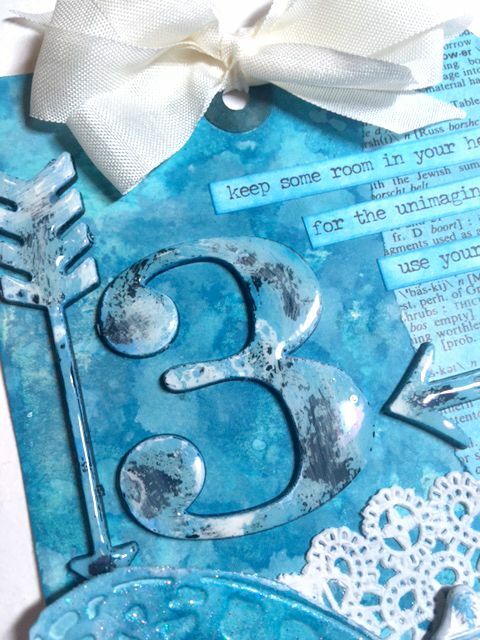 Beautiful shades of blue on this tag Yvonne, love it!! Such wonderful details on your tag! I like your monochromatic take on the challenge.